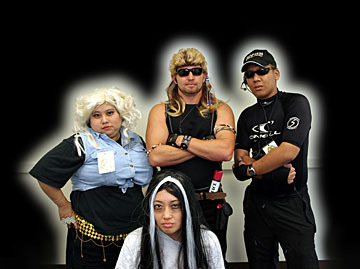 Laurie Abe and her co-workers at the Cancer Research Center of Hawaii modeled their Halloween costumes after Dog Chapman and his A&E show, "Dog the Bounty Hunter." 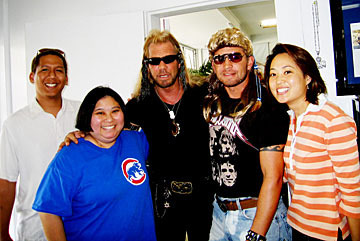 Crissy Terawaki Kawamoto, left, dressed as Beth Chapman; Amos Jarrette was Duane "Dog" Chapman; Robert Oum was Leland, Dog's son; and Abe was a bail jumper. The big fans of the show got to meet the real Dog at his Da Kine Bail Bonds on Monday when they dropped by to share their Halloween pictures.